This morning as I was driving my son to school I found myself at a one way intersection trying to turn right. The bus to my left had stopped, stopping all the traffic to the left so it looked like a good time to pull out and turn right. As I did a biker whizzed by from my right going against traffic and screamed at me. I am really glad she screamed because if she didn’t I would have hit her! I was pretty shook up as I am sure the biker was too. We both proceeded on our route. 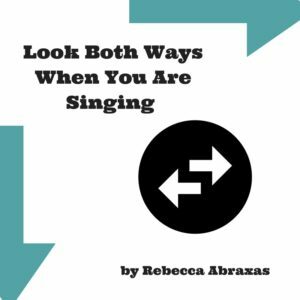 LOOK BOTH WAYS WHEN YOU ARE SINGING? Whether you are classically trained, not trained or afraid to sing outside your shower, it is an important practice to get off the auto pilot of looking at only one way of singing (or not singing). Using your voice is a multifaceted activity that not only requires body awareness but also, awareness of the energetics around you, your health practices, your relationships, your emotional reactivity, your thoughts and your perceptions. To feel totally free with your voice, it is my point of view that you must be free with your awareness, always in the habit of asking the next question each day to open up your voice. Each day is different. For example, today I woke up with stuffiness and congestion in my throat. This effects my voice immensely. What is this? Body what do you require? What can I do to change this? What can I do to sing thru this today? With out looking at my voice with these questions today I may plow thru my practice time frustrated and straining? Tending to what is on the table of your day and asking a question about your voice and the varied elements effecting it can create more ease with your voice even on the most challenging days. I realize some of those challenges may be that you are a closet singer and using your voice is a private matter. Do you want to continue on that journey or would you like to have more freedom. You may be very familiar with looking left on a one way but you may need to look both ways to get the bigger picture and open up your awareness to gain the freedom you are seeking. What is this fear? What is holding me back? When did this begin- How old was I? What event, judgement or conclusion am I making vital in my life that is cutting me off from expressing ME? What ever perspective you are used to looking at your voice with, today look the opposite way and see what is there for you. See what shows up for you to be aware of, shift or change so you can gain more freedom with your voice! I would love to hear them below!